If you’re a regular or returning visitor to No Game No Talk, you probably would have noticed something different about our site. Besides the a new look, less obvious is the content direction we’ve come to take after careful consideration. We thought we’ll take the opportunity to walk you through what’s new at No Game No Talk. The most important goal of No Game No Talk’s redesign is to provide a more pleasant reading experience and an easier way for you to find stories you’re interested in. We’ve reduced the site banner size (because seeing a big red banner on every page was a tad excessive) and placed larger story headlines at the top of each story, so you always know what you’re reading when you click a link. We also switched to a narrower font and added more line spacing, which should make for an easier read. The site navigation bar now follows you as you read, making it easier for you to visit any of our six major sections. We’ve also added a “hot topics” bar to highlight current hot and trending topics, so you’re always in the loop when it comes to the latest news and discussions. And to make it easier to quickly skim through all our recent stories, we’ve made the front page and archive sections far more compact than before. 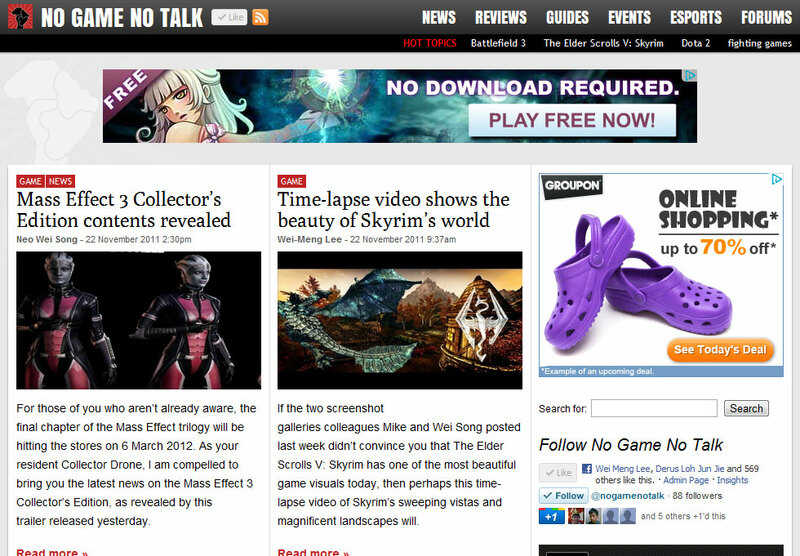 One of the most obvious changes is the introduction of paid advertising on No Game No Talk. We’ve gone from no ad spots one week ago to three in our current layout. Advertisements and marketing partnerships are important for No Game No Talk going forward. They’re our main source of revenue and help keep our quality content flowing and our servers running. 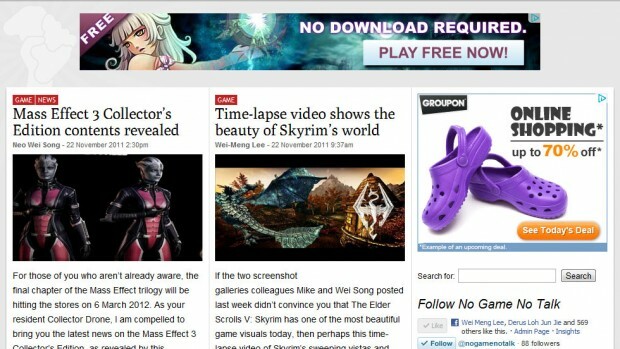 Advertisements also help bring relevant content and products to your attention, so I believe it’s a win-win scenario. One of the simplest ways to support No Game No Talk is by adding us to your ad blocker’s whitelist. I promise that the advertisements we carry will never be obtrusive. Our advertisements may be in conspicuous positions to get your attention, but they’ll never interfere with your browsing of the site in any way. They will never expand to block the content you’re here to view or play annoying sounds without your intervention. And if they do, get in touch with me and I’ll have the offending ad removed. That’s my personal promise, as the owner-publisher of this website, to you, our valued readers. If you’re a long-time reader — and we’re talking about back when No Game No Talk was still GameSync.net — you’ll recall that we brought to you huge amounts of news and content about the Singapore esports scene and various community happenings. In fact, back then we were writing exclusively about the Singapore esports community. Today, you might notice that we’ve had an increased focus on game news, reviews, previews and guides, led by our game features editor Mike Lim. We added more game content on a hunch that this was what you wanted to see. Judging by the numbers, we were right — the vast majority of our traffic are from people reading our high quality game news and features. That’s not to say that we’re abandoning No Game No Talk’s strong esports heritage or community roots. Far from it. In fact, we’re redoubling our efforts on that front and are looking to recruit talent who are passionate about their community and the esports phenomenon. We’ll post up more details soon, but if you want to help esports or your specific game community gain the exposure they deserve, drop us an email at [email protected]. We’re specifically looking for writers interested in the Counter-Strike, Dota 2, fighting games, StarCraft II and Diablo III communities, but if you feel strongly your game community deserves to be featured on No Game No Talk, or if you are just interested to contribute, please feel free to apply. We appreciate every volunteer.